Shopping for Call of Duty Construction Toys? Ideal for clandestine operations at sea, Rigid Inflatable Boats (RIBs) allow amphibious troops to approach coastal targets without being detected. Prepare for a surprise strike when you build this RIB, with its jungle camouflage finish, rope detail, pivoting rear motor, and fuel can accessory. Then ready your two jungle SEALs for an underwater advance. The highly detailed, super-poseable micro action figures come geared for the mission with diving masks, detachable armor, rebreathers, flippers, light machinegun, submachinegun, and knives. 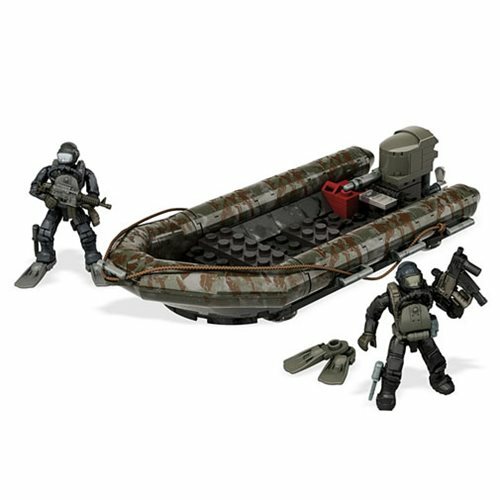 Combine with other Mega Bloks Call of Duty sets (sold separately) and build the mission! Ages 12 and up.